I had a dream! For 35 years Sue Reid of Grande Prairie, Alberta, Canada had a dream of walking in the footsteps of her great grandmother. Not in some of the most famous places in the world - from the Capital of Carrick to Maybole shore! And recently she did just that. It was in February 2003 that Maybole web site, www.maybole.org, received an email from Sue who was researching her family history and had found a connection to the capital of Carrick. 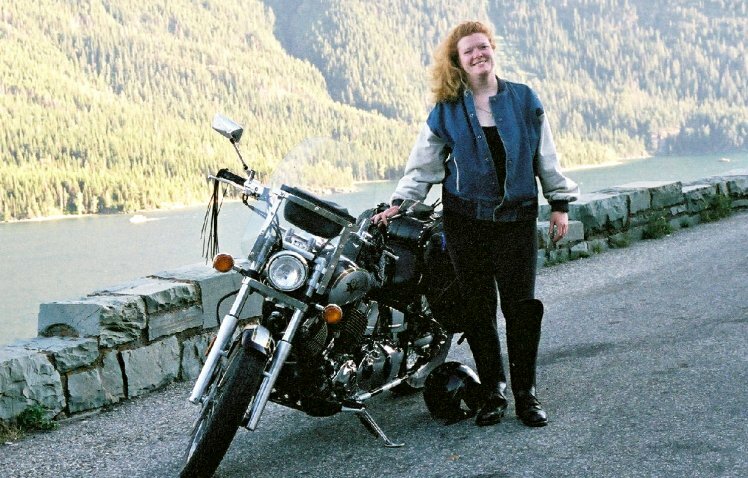 She started to plan a trip from Canada to Maybole last year but was involved in a motorcycle accident in July which prevented her from visiting here in September. As she said in another email just before leaving home, "I am whole again and very, very excited." 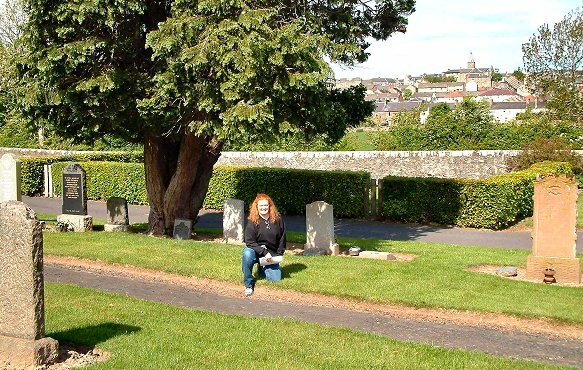 Sue spent three days recently in Maybole and met Billy McDowall (her 6th cousin) and visited places her grandfather and other relatives lived. These included Weaver Vennel, Welltrees Street and Welltrees Square. 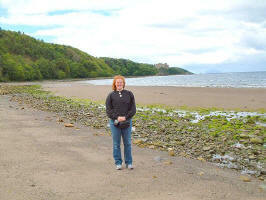 She added, "I wanted to take a walk to the coast from Maybole, walking in my great grandmother's footsteps. My dad remembers Great Gramma telling him how she used to walk to the shore with her friends and explore the caves, so I wanted to walk the same walk and video tape it for him - to give him pictures for his memories." Working on the family tree for a few years created a desire to see Maybole and try to find any relatives Sue might still have had here. The only piece of information she had was a receipt for a telegramme sent to a Nettie McDowall in 1968 when her great grandmother's daughter Margaret was returning to Maybole to visit. Sue found the Maybole website, and decided to email in hope that there were still relatives of Nettie who would like to contact her. Sue said, "What happened next was nothing short of miraculous! 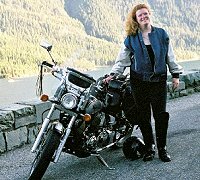 With one email inquiry we found an entire branch of our family that we thought lost since all older generations in Canada are now passed on." Working on the family tree for a few years created a desire to see Maybole and try to find any relatives I may still have there. The only piece of information I had was a receipt for a telegram sent to Nettie McDowell in 1968 when Margaret (Catherine Reid's daughter) was returning to Maybole to visit. I found the Maybole website, and decided to email you in hopes that there were still relatives of Nettie who would like to contact me. What happened next was nothing short of miraculous! With one email inquiry you found an entire branch of our family that we thought lost since all "older" generations here are now passed on. Sometime between 1917 and before 1922, my great uncle Robert Rae Reid left Maybole for Canada. No-one in the family had heard from him, so my grandfather Charles Brady Reid was sent to find him. My grandfather left Maybole for Canada in October of 1922 with promise of a job at a farm equipment manufacturing company called "Massey". Upon arriving, he found Massey on strike and ended up working at the shipyards in Collingwood, Ontario. In 1926, he sent for his wife Ivy and his daughter Ivy Jr. Another of his brothers, James Falon Reid emigrated to Ontario sometime between 1922 and 1930. In 1930, my great grandmother Catherine and her remaining two children, Henry John Jr. (Harry) and Margaret emigrated to Collingwood, Ontario to be with the rest of her children. As for ancestry prior to 1922, we know that Henry John Reid worked on road maintenance when he married my great grandmother Catherine in 1894 in Maybole. We also know that he died in Maybole in 1912 at the age of 39 although we do not know the cause. 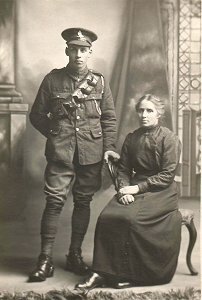 The photo to the right is my grandfather Charles Brady Reid and his mother, Catherine, circa 1917-1922. Click on the image to view full size. My father remembered Catherine talking about her sister Julia, and two of Julia's daughters who had also moved to Canada visiting his home when he was younger. The daughters that lived in Toronto were named Bette Sinclair and Jean Sheehan (we don't have her first name). When doing the family tree, I could find no trace of Julia or her children except for the telegram receipt mentioned above. 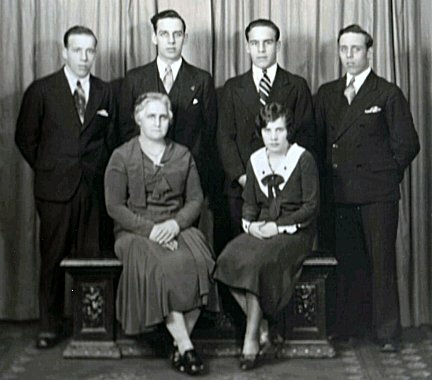 The photo at left shows the Reid family from Maybole circa 1930 (seated L to R) Catherine and her daughter, Margaret (standing L to R) Robert, Charles, Henry Jr., James. Click on the image to view full size. Text and photos contributed by Susan Reid, Grande Prairie, Alberta, Canada.